Some people consider wine to be one of the greatest gifts from God. Pair a superior wine like one Chianti Classico Riserva with the right food, and you cannot help but marvel at the spicy scent, with a hint of wood; the overwhelming rich texture and flavors of floral notes that is an ideal balance of fruits and tannin. Pair it with the wrong kind of food, and you not only fail to really indulge in the true wine experience, but also guarantee a bad hangover that will make you double over with acid pains. Most of us harbor a strong passion for chocolates. So much so that we do not hesitate to indulge ourselves right before enjoying a glass of wine. Chocolate adds a strong sensation to your palate that consists of tannin, sweetness and fattiness. When you combine this taste with a dry red wine, it tends to eliminate the taste of fattiness and sugar from your palate, leaving you with the overpowering sense of tannin – and hence, bitterness. The wine consists of two basic flavors: tannin and fruit. The flavor of the chocolate completely overrides the fruity taste of grapes of your red wine. In certain cases – especially with white chocolate (this constitutes no chocolate tannin) – it may work. But better not to risk it! Chianti Classico is primarily produced from Sangiovese grapes and about 3% to 7% of Merlot. 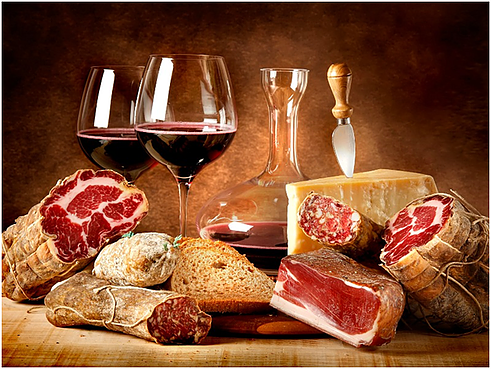 Traditionally, the wine is ideal for consumption with cheese and meats, displaying a high level of versatility here. However, your meal can become quite the disaster if you pair it with tuna. The flavor of tuna will make the Chianti wine taste metallic, while the vinegar will bring out the tannin and sour taste. Brussel sprouts are tricky in general. If best prepared, they taste earthy with a slight sulfurous texture. And that is precisely what makes it such a bad food pairing choice. The vegetable’s compounds tend to mimic the components of the wine – especially if you’ve opted for anything less than a superior kind. This one might surprise you because you’re almost certain that one of the best food pairings is wine and cheese. They work beautifully together. True. Except in the case of blue cheese. This is because blue cheese consists of a strong aromatic compound known as alkan-2-ones. The scent of this cheese is so dominant that it tends to overpower most dry wines. Harbor a passion for food and wine? Indulge in a truly remarkable experience with wine tasting and degustation in Chianti. Visit Montemaggio and enjoy the best Tuscan wines!